Campingplass La Vallée de l'Indre er en campingplass i Montbazon, Indre-et-Loire, som ligger ved en elv/bekk. Denne campingplassen har steder med avgrensning og plasser med noe skygge. Det er mulig å leie stasjonære campingvogner. Campingplassen har idrettsplass. Det er ikke alltid nødvendig å lage mat selv, for på campingplassen er det snackbar, restaurant (begrenset meny) og restaurant (med omfattende meny). På campingplassen kan man også kjøpe nybakt brød. Det er mulig å bruke internett, for på 80% av campingplassen kan man få tilgang til internett med egen laptop. Denne inspektøren besøker hvert år Campingplass La Vallée de l'Indre og inspiserer campingplassen for ca. 200 fasiliteter og for andre punkt som forekommer. Inspektøren er en medarbeider fra ACSI og arbeider ikke for campingplassen. Well being a true northerner I am going to tell it like it is. This campsite is rough, it looks like and is a very poorly maintained site. It\'s been over a year since the last review and nothing has improved. Pool has water in it but the surroundings are a derelict building site so not child friendly , none of the water points work and haven\'t done for some time, pitches are very overgrown. On the plus side location is great and only a short walk over the bridge into town which is excellent, next to the river and almost no flies which is a first, receptionist is very polite and speaks very good English but not happy in her job obviously, basically if this site wasn\'t next the town it wouldn\'t exist as nobody in their right mind would stay here willingly, thank goodness it was only a brief stopover. This campsite is conveniently situated for those travelling to the channel ports. The site is somewhat scruffy however an excellent restaurant adjacent to the site makes up for this. The main problem for motorhome visitors is that there is no water available from any of the standpipes on the site. The management claimed that this was the result of recent flooding however the taps themselves appear corroded (or missing) and the only alternative was the toilet block which was some way from the road and up several steps. Be warned! The very pleasant lady in reception explained the campsite had been flooded a few years ago and lots of work needed doing. That is very true. The toilets and showers were clean, but dated. The water was not very hot for washing up. The grass was in need of a cut and the flower planters were full of weeds. This site needs an urgent clean up. It is a shame as it is in a good location within an easy walk to a very interesting town. Shame the site wasn't as good as the receptionist. Don't stay here. Neglected site that floods. Pitches are overgrown weed patches. No privacy. Water taps broken. Toilets and showers broken and dirty. No security and felt unsafe. Stayed just for one hour and then moved to another site 20 minutes away. Town looks interesting - shame about the appalling campsite. Should not be in the ACSI book in our opinion. Friendly reception. Pleasant (unheated) swimming pool. Extremely poor, outdated and dirty toilet block. Pathways needing maintenance - weeds, rubbish and broken signs. Dirty plant containers with dead flowers. Grass uncut. NO security lights around campsite at night. Facilities on this site do require some maintenance. Toilet block is looking old and dated. Was being kept cleaner than at time of some earlier reports. Area surrounding the entrance and the roadway to most of the pitches requires some work. Small building opposite reception is scruffy and had rubbish piled up outside it. Good for use as a site to visit some of the chateaux in the area. Must have had problems with 'nomads' some time earlier, as were very fussy about letting utility type vehicles with large caravans into the site. We had to be vetted before entry. Vil du booke campingplassen Campingplass La Vallée de l'Indre eller få mer informasjon? Det går bra med opplysningene nedenfor eller via campingplassens nettsted. 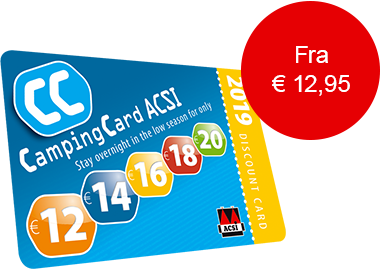 ACSI Eurocampings sender din forespørsel til "Campingplass La Vallée de l'Indre".